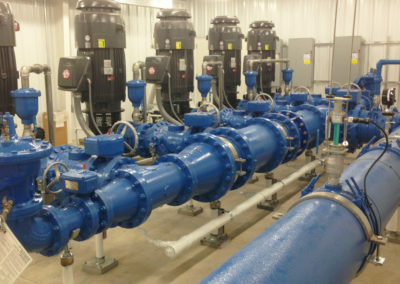 The City of St. Charles selected Crawford, Murphy & Tilly (CMT) for the Water Model and Water Master Plan project, which included the development of a water distribution hydraulic model (approximately 322 miles). The model was developed using the city’s GIS watermain base map and was assembled in WaterGEMS version 8i. The model was calibrated using hydrant pressure data. Once calibrated, average day demand and maximum day demand scenarios were developed in the model. The model was analyzed under each demand scenario to evaluate the existing system and to determine improvements necessary to improve pressure and fire flow. A future system model was also created based on anticipated growth that includes several residential, commercial and riverfront developments. Source, supply, storage, and distribution system improvements were identified to support future growth. A 10-year Capital Improvement Plan was created to prioritize recommended improvements. The project also included the development of an extended period simulation (EPS) model to evaluate water age, system operations and emergency scenarios. 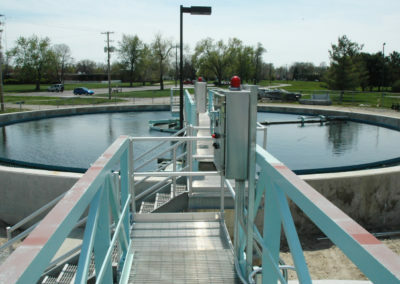 The EPS model was evaluated to determine the influence area of two different sources as water is pumped from the water treatment plant and joint venture pump station, which pumps purchased water from St. Louis. Multiple emergency scenarios will be created to determine system pressures, fire flows, tank volume and emergency operations during these events. An electronic version of the hydraulic model was provided to the city and several city staff members were trained on its use. 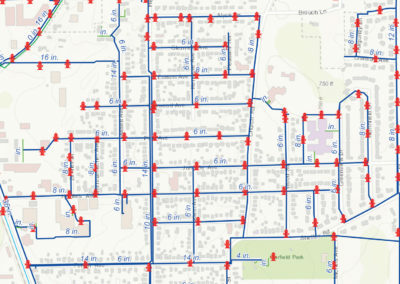 This will allow city staff members to evaluate “what if” scenarios of proposed developments to determine pressures and flows in the water distribution system.